A blog post by JMM Program Assistant Emma Glaser. To see past posts from Emma click here! Every year, the JMM participates in Mitzvah Day, a citywide day of service on December 25th. This year, volunteers at the JMM created backpacks with school supplies for immigrant students at the Esperanza Center, a local immigrant resource center. We were really thrilled to have so many people come together to make the backpacks – in fact, we were able to make 20 more than our original goal! Volunteers made 70 backpacks for students that were packed with notebooks, folders, pencils, erasers, and lots of other school supplies that kids need to succeed in school. Many of the school supplies were donated by the JMM’s amazing volunteers and members, as well as companies that we reached out to. As a new staff member, I was really moved by the community’s generosity in making sure the backpacks had all the supplies the students needed. 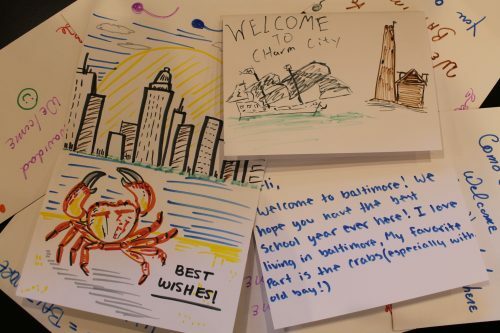 The backpacks also included notecards welcoming the students to the United States and homemade stress balls that Mitzvah Day volunteers created. 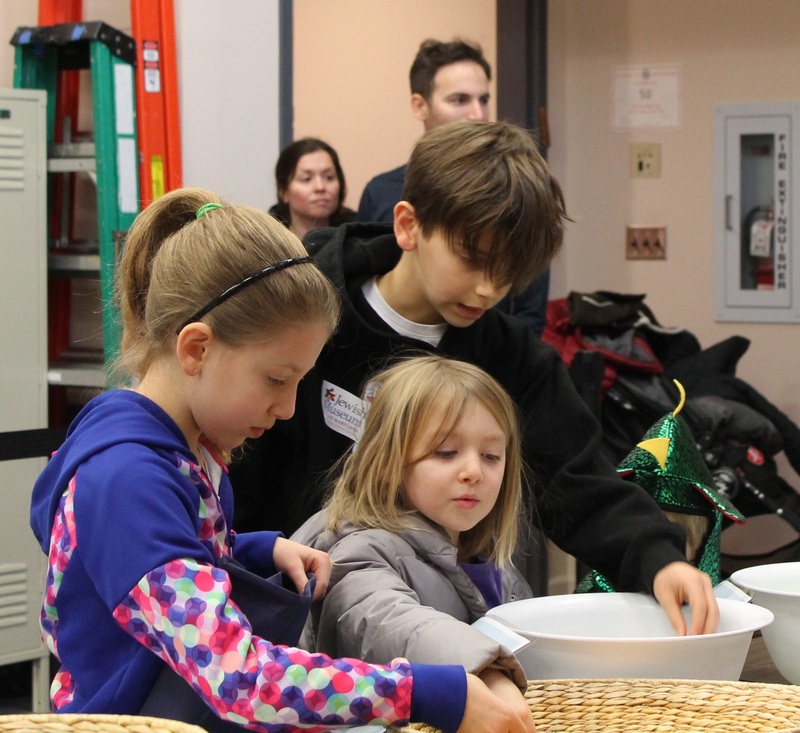 Take a look at some highlights from our magical Mitzvah Day below! 79 volunteers helped out on Mitzvah Day! These two friends told me it was the first time in 18 years that they were able to see each other. It was really heartwarming that they spent their reunion doing a mitzvah at the JMM. This family, including a very tiny dinosaur (on the right), worked together to make the last two backpacks. To make the stress balls, volunteers used funnels to fill balloons with flour. For instructions to make a stressball for yourself, click here. Volunteers wrote and decorated notecards with friendly messages to make the backpacks more personal. Many of them wished students happy holidays or told them about fun things to do in Baltimore. Here’s a couple of my favorite cards, drawn by some amazing artists. 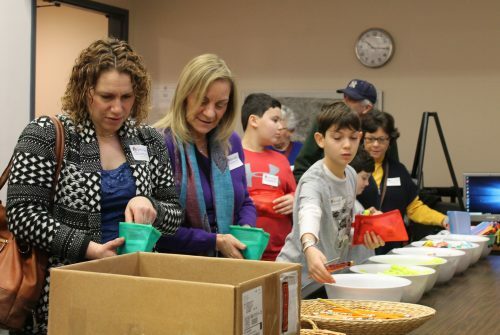 Thank you so much to everyone who participated in Mitzvah Day 2018! A blog post from JMM Volunteer Coordinator Wendy Davis. To read more posts from Wendy, click here. 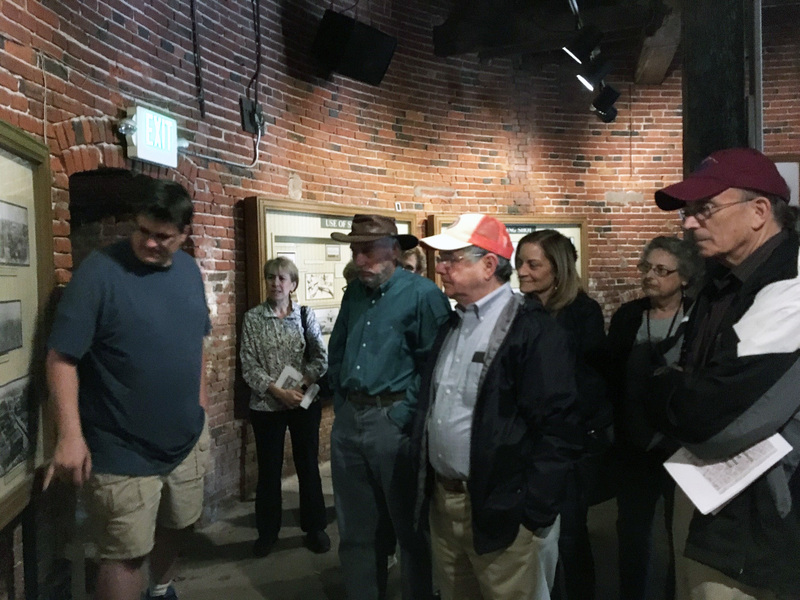 One of the fun benefits of being a volunteer at the Jewish Museum of Maryland is the opportunity to go on field trips with fellow volunteers. This October, our field trip started at the front door of the museum. 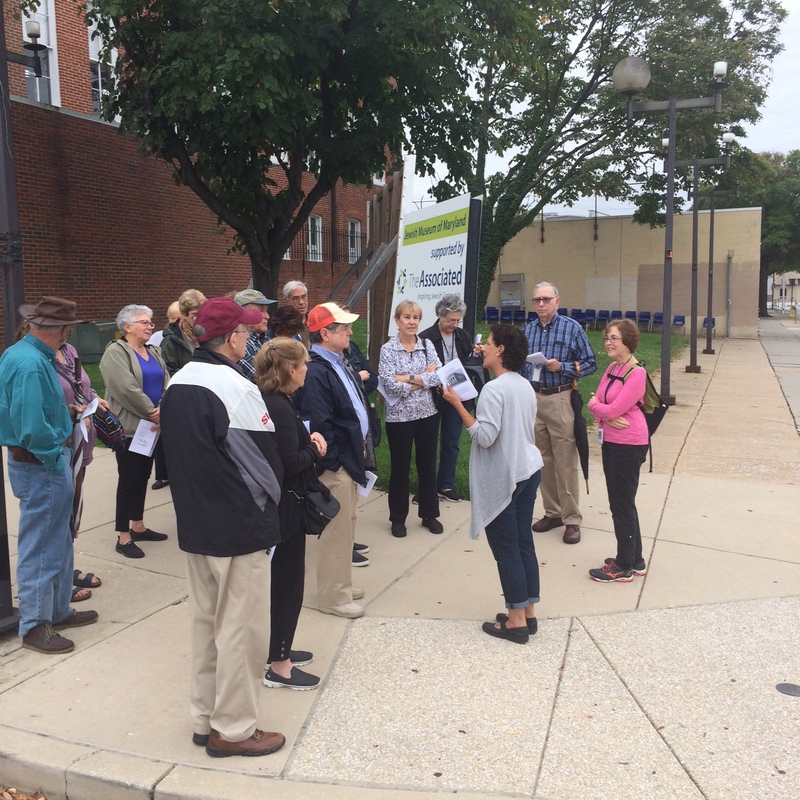 We ventured on a walking tour of our historic neighborhood, Jonestown. Did you know that after Baltimore was founded in 1729, Jones Town was the first neighborhood established outside the city? It was originally the home to wealthy residents such as the Carrolls and Edward Johnson, a Baltimore mayor. Then it became home for generations of immigrants, filled with shops and social institutions. 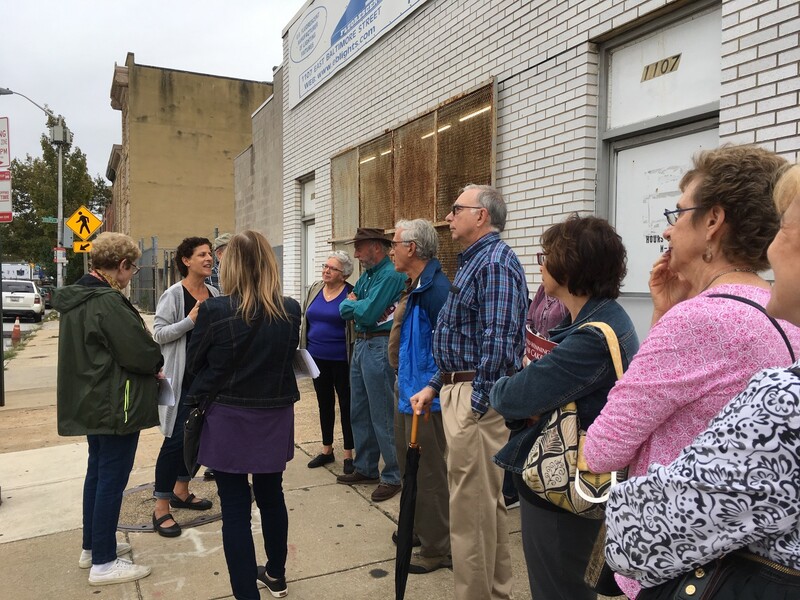 Using “The Jewish Museum of Maryland Neighborhood Walking Tour” as a guide, Ilene Dackman-Alon lead us, engaging us in stories about various buildings and the people that lived and work in the area. 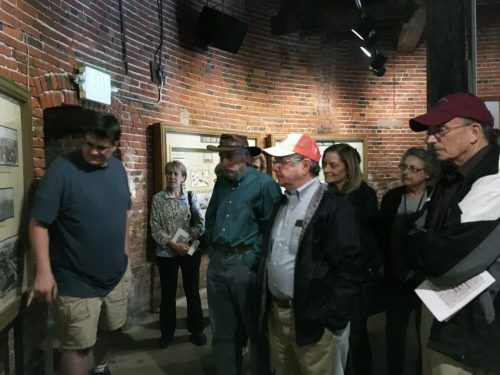 Touring the interior of the Shot Tower! We all delighted in exploring the neighborhood, seeing up close buildings that we quickly drive by, being able to read the plaques on the historic building, hearing the words of people who walked the streets of Jonestown years ago, appreciating the wonderful teacher Ilene is and enjoying each other’s company. Volunteer Spotlight on Robin Kaplan! Post by Volunteer Coordinator Wendy Davis. Periodically we highlight one of our fantastic JMM volunteers. If you are interested in volunteering with the JMM, send an email to Wendy at wdavis@jewishmuseummd.org or call 443-873-5168! You can also get more information about volunteering at the Museum here. Why do people volunteer at the Jewish Museum of Maryland? Robin Kaplan, a volunteer in the JMM’s gift shop Esther’s Place has great reasons. She was attracted to JMM because it gave her the opportunity to have things to do after retirement, to talk with people, to help out. Robin has found the people at the JMM to be nice and the staff helpful, friendly and patient. 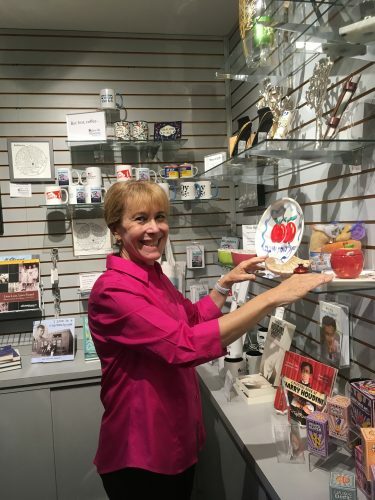 When asked what gets her excited about volunteering at JMM, she responded that she likes to see the people and there is creative and appealing new merchandise in Esther’s Place each time she comes. Pictured is Robin creating merchandise displays for the new Rosh Hashanah stock. According to Robin, one of the benefits of interacting with museum guests in the shop is learning new things. Robin had the idea of purchasing some magic tricks which were added the to the shop’s inventory to augment the current Houdini exhibit. She was hoping to perform the tricks to entertain her children during a family gathering but she had a problem. She didn’t know how! Luckily a set of grandparents and their 3 grandsons who viewed the Houdini exhibit, came into the shop. After noticing magic tricks, the college age grandson proceeded to demonstrate the tricks for his grandparents and in the process, Robin was able to learn how to be a magician. Sharing time with the JMM is a family thing; Robin’s husband, Abe Kronsberg volunteers on special projects and is a member of the JMM Board. Robin also volunteers with Experience Corps, an organization sponsored by AARP and Americorps. The organization assigns volunteers to Pre-K to 3rd grade classrooms in under-performing schools where they work with students on improving their literacy skills. For the past 3 years she was assigned to City Springs Elementary School, right down the street from the museum. This year she will be at Mt. Royal Elementary/Middle School. She spends about 10 hours a week with the kids. In addition, Robin tutors one afternoon a week for Living Classrooms. Furthermore, Robin loves to travel. She recently returned from a cruise to Bermuda with her family. She said that the trip was fun, but the company was even better. In a number of months, Robin and her husband Abe will be going to New Zealand and Australia, places she has always wanted to visit. Abe has never been to Israel, so that is definitely on their bucket list. 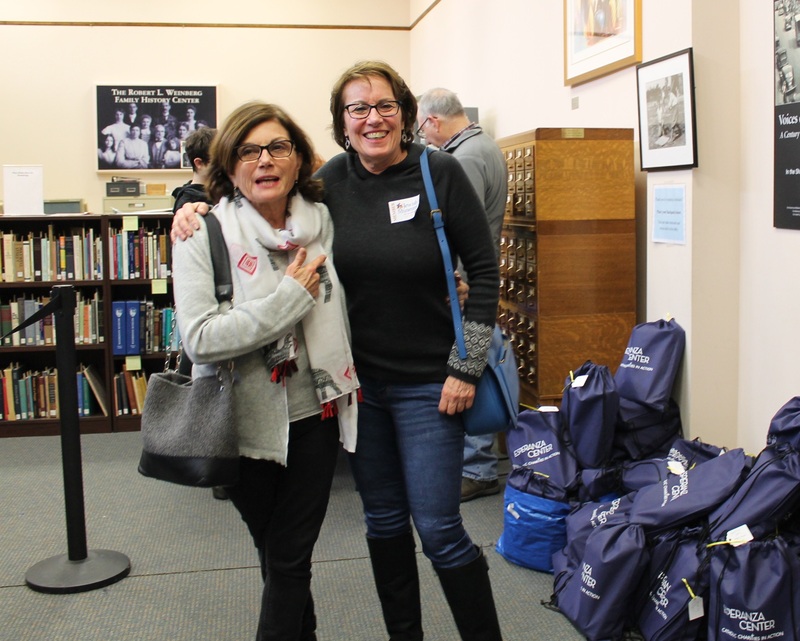 Prior to volunteering, Robin was a lawyer for the Social Security Administration for 40 years. She worked mostly in the General Counsel’s office providing legal opinions and on cases in which people sue for disability benefit. Her last position was as executive secretary to the Social Security commissioner who oversaw the entire agency. Robin is the proud mother of two sons. Her oldest recently moved back to Baltimore with his wife – they are living in Patterson Park. The other son lives in Brooklyn, New York with his wife and Robin’s “incredible” granddaughter.